One of my favorite comedy movies of all time is “Trading Places” with Eddie Murphy and Dan Aykroyd. It just screams 80’s buddy comedy to me. So I thought it was really great to see we are finally getting toys from this film. Taken from one of his last scenes in the film, this is “Gorilla Costume Clarence Beeks. Paul Gleason fans can finally get their hands on a plastic representation of this character acting icon. Besides the devious Mr. Beeks, Gleason is probably most famous for his role in Die Hard. 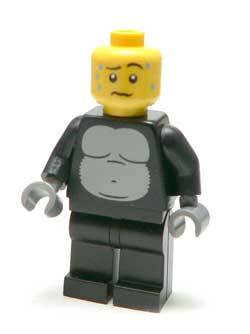 The great thing about a guy in a gorilla suit, is the detail doesn’t have to be perfect to be a good representation. After all, this was a gorilla suit that Jim Belushi was wearing before he had any fame of his own. There have been plenty of instances of gorilla suits on film, but never a really good figure of one. Sure ape figure abound for King Kong and Planet of the Apes. But a man in gorilla suit? Can’t recall one. Dude in a whacked out bunny suit for Donny Darko, yeah. Gorilla, no. The well painted silver zipper down his back is one of the details that really sells this. Would it have to be there? No. But being there, makes this figure a bit better. The sculpted head piece doesn’t have the long look that the movie mask had, but this is a cartoony version. 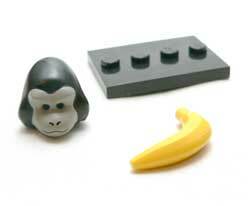 The monkey head isn’t just a sculpted single piece, it comes off to reveal Beeks face underneath. The little beads of sweat on his brow sell the fact that he has just became the wife of an actual silver back gorilla. 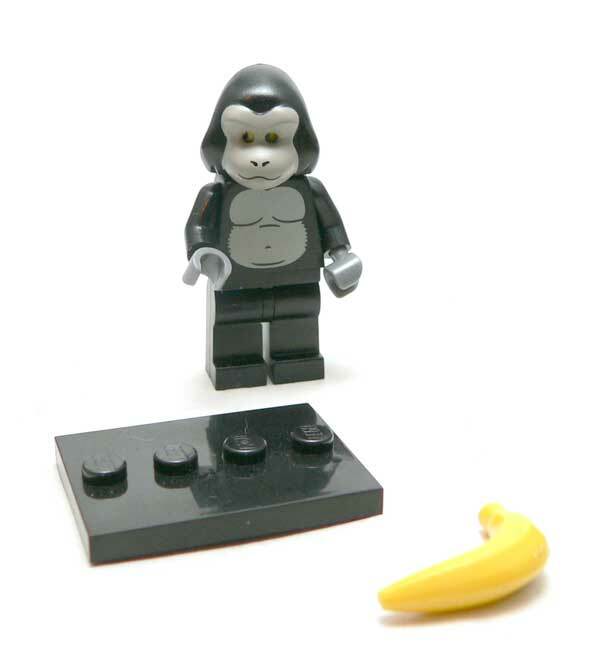 Turn the monkey head so you can see just a tad bit of yellow and you have the perfect Beeks look. Of course Lego figures are fun. I’d bet there are few people that could pick one up and not play with it. 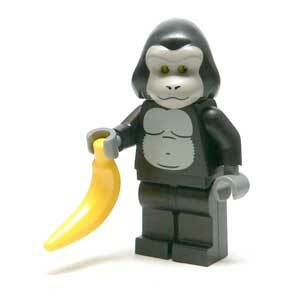 In addition to the monkey mask, Clarence here comes with a giant banana. At least I hope it’s a banana. He can hold one end in a dirty paw. I have to say the look when holding the banana is rather disconcerting. Maybe it has something to do with his male gorilla cell mate. Rounding out this figure is a small black display stand. It’s pretty generic and I really don’t know many folks that would even want to use it. The one obvious omission from this figure is the frozen concentrated orange juice crop report. Yeah, I know he never had it when he was in the gorilla suit, but it really is the key prop for the third act of the film. Nice! 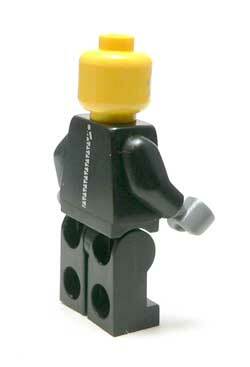 I love those LEGO minifigs, even though chasing for them is madness. If they were a dollar cheaper I’d be totally addicted. I love hearing what other people think about these little guys – they’re adorable and so much fun! 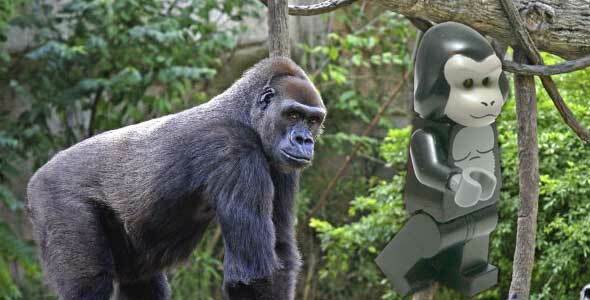 What I really love about the gorilla head is that you can throw it over pretty much any LEGO head and any body allowing for some excellent combinations like Gorilla Samurai or Mad Gorilla Scientists!